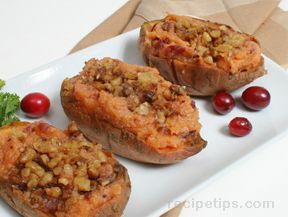 Sweet potatoes are always an anticipated seasonal favorite. This terrific recipe provides them with a spicy kick that is sure to be a hit. 1/2 of one chipotle chile in adobo sauce, mince it into a paste. Rub potatoes with oil and poke sparingly with a fork. Place directly on oven rack with a baking sheet below or place potatoes directly on baking sheet to catch drippings. Space the potatoes evenly apart. 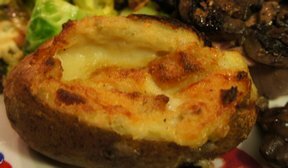 Bake until skewer or fork slips easily into the potatoes, approximately 50 minutes. Set on wire rack to cool, leave oven on. When potatoes are cool enough to touch, slice off the top 1/4-1/3 of each potato lenghtwise to expose the interior flesh. This forms a "boat" to hold the sweet potato mixture. Peel off the skin from the tops that were removed and put the flesh in a medium sized bowl. Use a small spoon to scoop out the rest of the flesh from each potato. Leave approximately 1/4 inch of potato around the inside edge of the skins. This helps the potato to retain its shape while cooking. Beat the potato flesh, sour cream, chile paste, butter and salt with and electric mixer on medium speed until smooth. Taste the mixture at this point, you may add more chipotle paste if you want it spicier. Mound the mixture into the potato skins and set them on a baking pan. 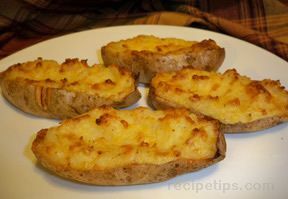 Bake stuffed potatoes in the 425° oven 20-25 mintues. Serve with lime wedges and sour cream. Sprinkle with cilantro before serving, optional. "I will give this a 5 based on the ingred. 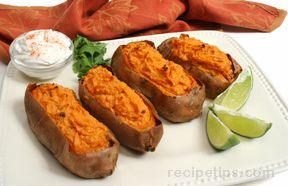 I am always looking for a recipe for sweet potatoes that doesn't use more sweetness as the potatoes themselves are sweet enough. Am anxious to try. tx!" "OMG - this is one of the best potato recipes that I've fixed and eaten in a very long time. I had it for my Easter dinner. I fixed brown sugar glazed ham, potatoes and asparagus. All of the tastes blended so well. I did want to add the rest of the chipolte pepper and it came out sooooo good. The recipe is securely tucked away in my recipe box. Thanx!!!!"